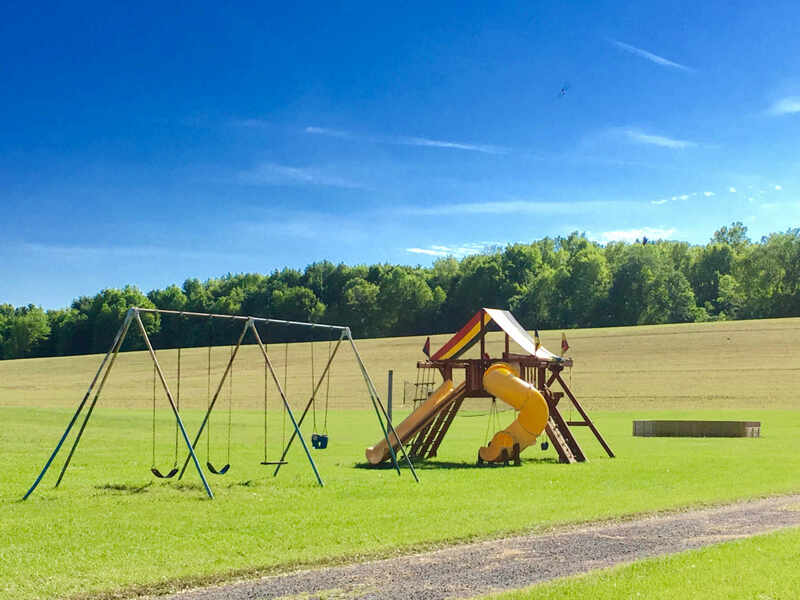 Activities - NorWin Campground and Fruit Farm, Inc.
*Extended Pizza and Fried Dough Stand hours on holiday weekends!! 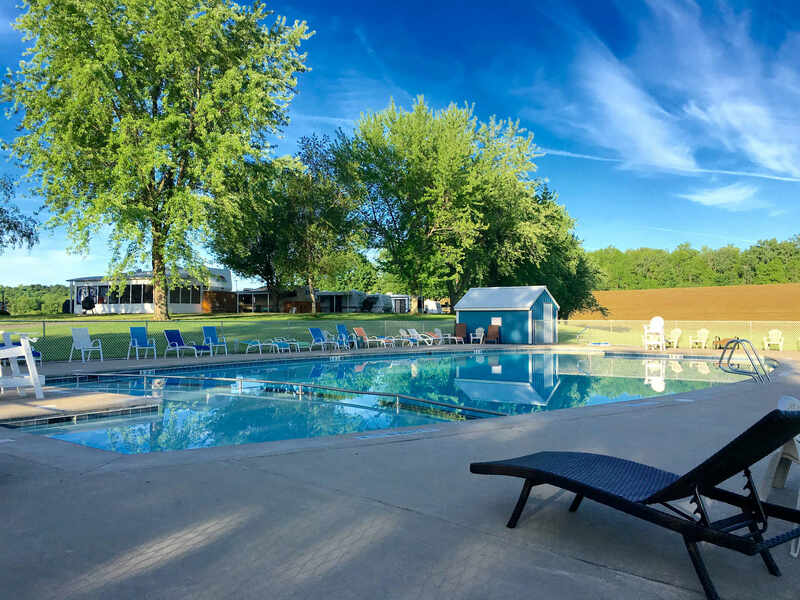 SWIMMING POOL | Our swimming pool will be open for the season starting Memorial Day weekend!! Our pool hours are 10-12, 1-5, and 6-8 on weekends until school is out; and then daily, weather permitting, through the end of July. 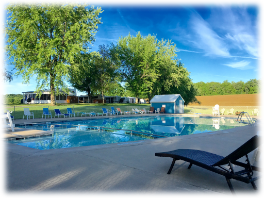 Starting August 1 the pool will be open 11-12, 1-5, and 6-8 as needed. There is always a lifeguard on duty when the pool is open. Please observe our pool rules, which are posted on the entrance gate at the pool. All children must be supervised by an adult INSIDE the pool fence at all times. 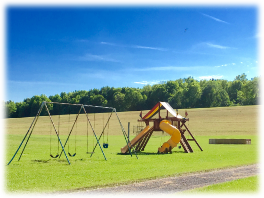 ACTIVITIES | We offer free golf on our 9 hole, par 3 golf course, as well as catch and release fishing and frog catching in our 5 acre pond. 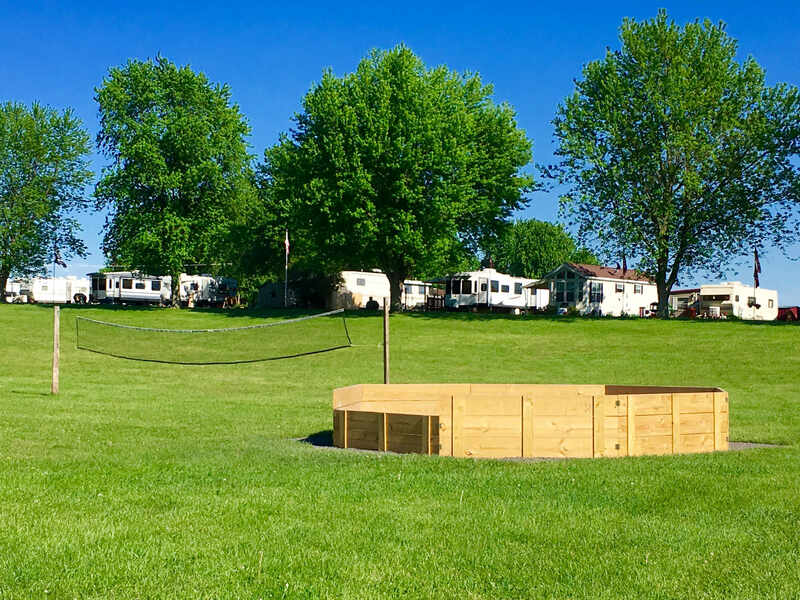 We also have horseshoe pits, 3 playground areas, a basketball court, volleyball net, gaga ball pits, as well as paddle boat rentals. WI-FI | Our rec hall is open for your arcade and Wi-Fi pleasure during regular business hours. APRIL 26-28 | Opening weekend! Join us Saturday for free coffee and donuts in the Rec Hall at 10am! Help us celebrate Stella’s 4th birthday all weekend long! Receive a FREE Birthday cookie with every $10 minimum Pizza Stand order. MAY 3-5 | Cinco de Mayo Weekend! Nachos and corn tacos on special at the Pizza Stand all weekend! MAY 10-12 | Mother’s Day Weekend! Three Brothers Wine & Beer tasting Saturday 4-7 PM. 21 and older ONLY. NO children. 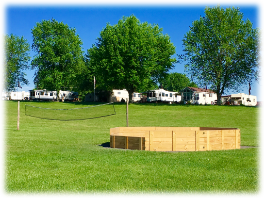 MAY 17-19 | Camper Appreciation Weekend! Join us for a tailgate-style party Saturday 6:30-7:30. We provide the snacks and drinks! MAY 24-26 | Memorial Day Weekend! Swimming Pool Opens for the season!! MAY 31-JUNE 2 | Everyone’s an Artist! “Strokes of Colour” - Saturday at 2pm, join us for a “Painting With a Twist” style party! Price TBD. Sign up at the office by May 26. The project this year is a “Welcome to our neck of the woods” canoe sign! JUNE 7-9 | Pot Luck Supper! Pot Luck Supper Saturday in the Rec Hall at 6:30pm; sign up at the office by May 28. JUNE 14-16 | Father’s Day Weekend! JUNE 21-23 | Annual Hot Dog Roast Weekend! Three Brothers Wine & Beer tasting Saturday 4-7pm - 21 and older ONLY. NO children. Annual Hot Dog Roast Saturday at the pavilion at 7pm. All you need is a stick!! Free for our campers, $5 each for visitors. JUNE 28-30 | Strokes of Colour! JULY 4-7 | Happy Independence Day, America! Fireworks July 4 at 10pm! JULY 12-14 | Hill Cumorah Pageant begins + Peppermint Days Weekend! JULY 19-21 | Merry Christmas in July! Here comes Santa! Saturday at 6:30pm sign up at office. JULY 26-28 | Chili Cook-off! Chili Cook Off Saturday at 6:30pm Prizes for best chili and best cornbread! AUGUST 2-4 | Decades Weekend! Tie-Dying Saturday at 2pm. Bring a 100% cotton washed garment. Sign up at office. Free for our campers. $5 each for visitors. AUGUST 10-12 | Make a Masterpiece! Saturday 2pm. - “Strokes of Colour” joins us again. Sign up at the office by August 4 to paint your own birdhouse ornament! Price $TBD. AUGUST 23-25 | Reel ’Em In! AUGUST 30-SEPTEMBER 2 | Labor Day Weekend!! Three Brothers Beer & Wine tasting - Sunday 12-3pm - 21 and older ONLY. NO children. SEPTEMBER 6-8 | Help Support Our Troops! One half price Sunday breakfast per party with a $5 donation to benefit the Veterans Outreach Center - in honor of Noah’s birthday!! SEPTEMBER 13-15 | All you can eat Spaghetti Supper!!! SEPTEMBER 20-22 | Halloween Weekend!! Decorate your site! Free Cider and donuts Sat 10am in the office for campers, $3 each for visitors. Final Bingo Sat 7pm. Last round for returning seasonal campers only! $1/card and pot goes to next seasons camping!! Sunday please stop in office to say goodbye! ALL ELECTRIC BILLS MUST BE PAID IN FULL BY SEPTEMBER 30th!! !